My aunts’ funeral is today. I tried to figure out how to get there but with two dogs it wasn’t going to be reasonable. My last oncology appointment was yesterday. It’s been 10 years since my breast cancer and since the tumor in my head is benign I’m all done! I’m taking 3 classes on coursera.org so I’ve been studying a lot and keeping busy that way as well. Two courses are pretty simple introductory courses but the third is called Introduction by Mathematical Thinking and its taught by Keith Devlin! It’s a tough one. I’ve spent 99% of my time on that one course. Kalev and I have spent a lot of time bonding. We play together, instead of just working together. I can tell the difference in our bond in just the past week. Our trainer was honoured by the town where we do all of our training last Tuesday. Kalev and I were there. Kalev got several photos taken of him. He’s so photogenic! It was hard for me, standing up in front of all those people. Kalev knows when I’m upset but he acts out then, I guess because he doesn’t know what else to do for me. We are still learning how to interact during those times, he needs to learn to be calm but supportive and I need to learn to pay attention to him instead of getting more frustrated and upset. My truck is needing some repair so I hope to get to the repair shop on Monday and see what it will take to get it repaired. I’ve been doing some exercising and today I can feel it. But I hope it will help me lose some weight. He found out yesterday when we went to the firing range. After the past couple weeks there’s been so much emotional content that my regulator went “sproing!”. I’m not sad, not depressed. I think the psychs would call it “dis-attached” or something like that. It’s a strange place to be. Watching the world go by. Not really connected to the world. Shock might be a way of describing it, prolonged shock. But it’s better than being where I was. Maybe it’s my brains way of giving my mind time to heal. 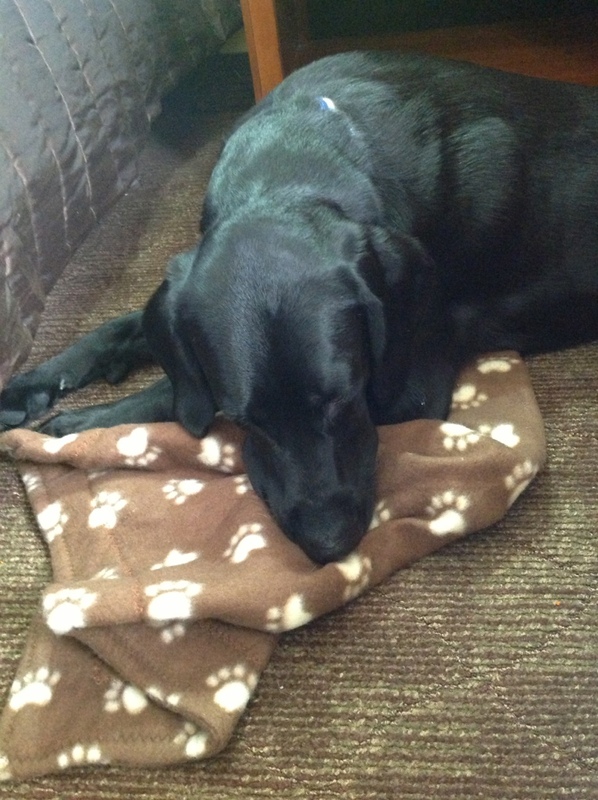 When Kalev graduated from his training he received a small blanket to take with him to places to use as a “settle” spot. We brought it with us on our trip. This will be Kalev’s first flight. 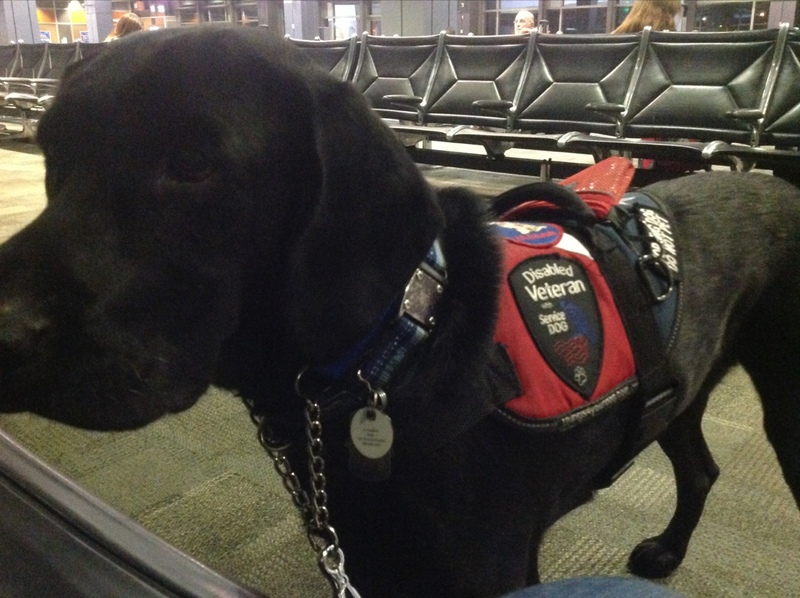 I called the American Airlines and told them that I would be bringing a service dog. They said they would have someone in their customer care center call me back to go over details. I am quite impressed. They worked with me to get Kalev a good seat (by the bulkhead so he’ll have more room) and told me what requirements are needed. Because Kalev does some mobility tasks for me they listed him as a mobility dog rather than a psychiatric dog. She said that would bypass some of the paperwork required because she was aware how difficult it was to get into the VA to get the required paperwork on short notice. But after this flight is over I’ll go to their website and find out what the requirements for their official letter is and take it in to my psych and get it written. Cross your fingers for Kalev to have a successful first flight. I just found out today that my aunt, who has been battling brain cancer for some time, has been sent home with Hospice. I still have two regrets in my life, both were friends that were dying of cancer and I waited too long to say goodbye. Fear of what to say, what not to say. This time I will not make that mistake. I will go, and talk, maybe cry, smile, maybe laugh. I will say goodbye. Kalev and I will be flying to Little Rock to catch a ride with my little sis and drive to southeast KS together. It will be Kalev’s first flight. It will be my first flight since an elder relatives funeral, also in southeast KS almost 7 years ago. I am fragmented now, uneasy, unsure, but determined.